In 1973, it really was unusual to see a woman, yes a woman, fronting a rock band. 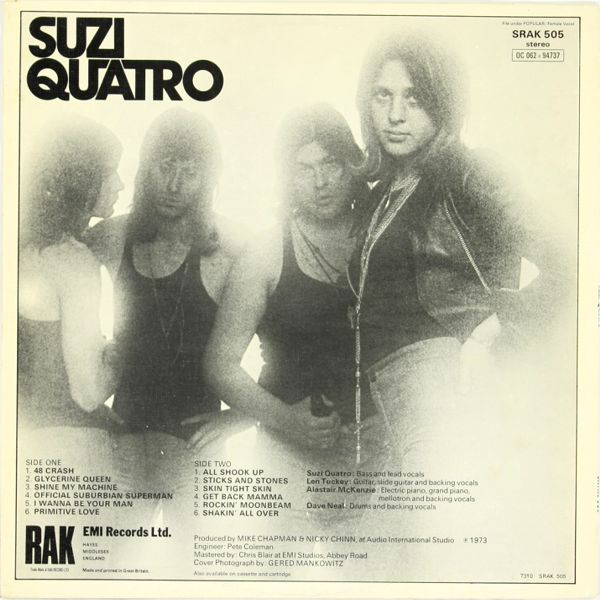 Yes there had been the wonderful Janis Joplin and "adult rock" artists like Jefferson Airplane's Grace Slick and Curved Air's Sonja Kristina, but Suzi Quatro was a chart act. Until then it simply had not happened. I remember when she first appeared on "Top Of The Pops" doing "Can The Can". She was the talk of the playground the next morning, particularly for teenage boys like myself. "Did you see her?" was the question everyone asked. Glam rock acts, on the whole, didn't produce albums of much quality. This is different. It didn't contain the single "Can The Can" (although it did contain the follow-up "48 Crash"). The latter kicks off the album in true glam rock drum style. "Glycerine Queen" is full of T.Rex riffs and a bit of a "48 Crash" repeat chorus, but either way this is quite good quality three minute commercial rock. 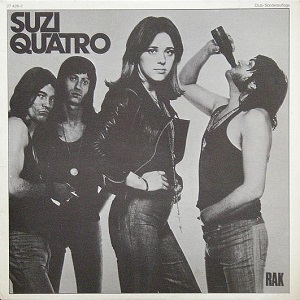 Suzi and her band of (portrayed as) feckless, hard drinking males are on top of the game. The sound quality is excellent too. Wonderfully remastered. "Shine My Machine" is a great Canned Heat style rocker. "Official Suburbian Superman" a piano-driven slow pounder. Some great guitar on it too. "Primitive Love" would seem to follow on from Hotlegs' 1971 hit "Neanderthal Man", with its jungle drumming and caveman noises and chant-like lyrics. "Primitive Love, Primitive Love, Primitive Man Make Primitive Love". "You Tarzan Me Jane, Primitive Love Is What I Need". OK Suzi, if you insist! There are a few covers on here. The Stones' "I Wanna Be Your Man", Elvis's "All Shook Up" and Johnny Kidd's "Shakin' All Over", but they are handled well and don't detract from the quality of the album. Particularly "I Wanna Be Your Man". Singles "Can The Can" and "Daytona Demon" and their 'B' Sides are included in the bonus tracks. "Brain Confusion" and "Ain't Ya Something Honey" are excellent. Yes, of course this is no masterpiece, but as a more than acceptable example of a glam rock band doing an album, it is surprisingly good.